I thought this was a pretty cool article. It's nice to see Hunter getting some attention. On a roster that rivals the defending title-winning Philadelphia Eagles in terms of top-to-bottom talent, it's easy to see why Hunter may be overlooked. 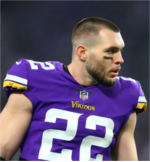 There's an argument to be made that Stefon Diggs, Kyle Rudolph, Everson Griffen, Eric Kendricks, Anthony Barr, Xavier Rhodes, Harrison Smith and new $84 million quarterback Kirk Cousins have all, at some point, been deemed faces of the Vikings franchise. Even among his own front-four peers, let alone stars around the NFL, Hunter doesn't quite command the spotlight of Griffen, Linval Joseph or Sheldon Richardson. And yet, in a league where the top crop of sack artists is still populated largely by seasoned veterans, who else could possibly be the cornerstone of the NFL's next generation of edge rushers? Joey Bosa, Myles Garrett, Jadeveon Clowney and DeMarcus Lawrence might come to mind. But Hunter is taller than Bosa. He's faster than Garrett. He's healthier than Clowney. And he's still younger than almost all of them. Hunter has huge potential. Hopefully he lives up to it this year. If he and Barr play like they can, we will have one wicked D.
Next Dline great in a long line of Purple People Eaters.